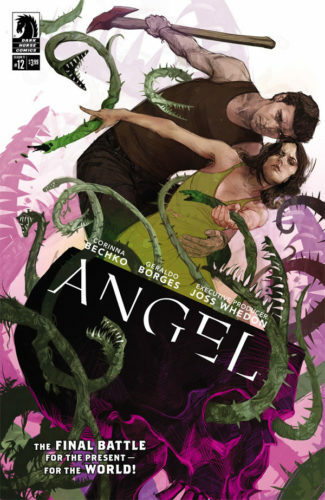 As we start this issue, we see that Angel is still fighting against the monster plants and bug swarms, alongside Fred. It seems like nothing they do can end this siege. That is, until a near-miss becomes a fortunate clue as to what they need to do. The plants are doing a number on Fred, tossing her around and almost getting her flattened as she’s dropped from far heights. 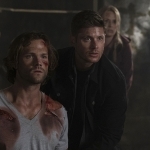 Thankfully Angel’s there to catch her, so she lives to fight another day. In the process of falling, one of the plants had grabbed hold of her suspenders. The items are apparently poison to the plants, as it starts disintegrating. Aha! A clue! Is it the material in the suspenders that are causing the reaction, or perhaps the fact that they are an impossibility? The suspenders wouldn’t exist in this time if Fred hadn’t brought them with her, so maybe getting rid of all the belongings they carried with them through the time rift will cause the plants to die. It’s worth a try. Because they are having to strip their clothing, Fred becomes modest and that brings out Illyria. The two of them have an interesting relationship as they share space in Fred’s body and mind. I’m very interested to see how this evolves over time, as it has already grown quite a bit in the time they’ve had so far. It’s complicated, but they’re working through it, and that’s all they can do. Back to the battle, Angel and Illyria start throwing their clothes at the plants. The act seems to be working, but then the plants start growing again. That’s when Illyria fights that Angel still possesses something that is causing the time paradox to hold. Turns out it’s Kathy’s ring, and Angel is understandably reluctant to part with it, but he has to. And once he throws the ring at the plants as well, all the plants and swarms disintegrate and the immediate danger is over. 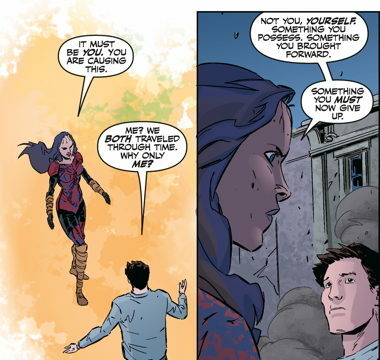 As we near the end of the issue, we get some deep contemplation from Angel and Illyria. While the vampire thinks that everything that happened was his fault, Illyria is quick to tell him that he must accept both the good and bad of his actions. Yes, his choices caused the rift and brought forth the monsters, but he also helped to heal it. He has to recognize both sides of his existence. And with that, we end the comic on a seemingly positive note. They will all move forward with life, whatever may come. Onward to the next adventure!